With so many HVAC Vacuum Pumps to choose from how can you make sure you’re purchasing the right one for your job? Most air conditioning systems today require a critical charge for optimal operation this makes them very sensitive to moisture and other contaminants which can freeze up the system, corrode the metals, and sludge the oil. It’s extremely important to remove moisture with a quality vacuum pump before the critical charge takes place. A vacuum pump lowers the pressure inside the system to below atmospheric pressure causing water vapor to boil off and vent into the atmosphere. The contaminants from the system being evacuated can end up back-in the vacuum pump oil, so it’s necessary to frequently change your vacuum pump oil for peak pump performance. You know why you need a vacuum pump but what size do you need for the job you perform on a regular basis? 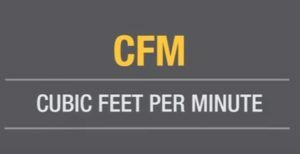 Pumps are rated in CFM or how many Cubic Feet of air they move from the system per minute. The faster air moves the faster you’ll reach the vacuum specified by the system manufacturer. A general rule is to take the Square Root of the tonnage the system your servicing to determine the CFM rating you need for that particular system. For example 16 to 25 ton systems typical for a residential air conditioning system would evacuate officially with a 4 or 5 CFM pump. For large 36-264 ton systems which are found on most rooftops of large commercial buildings a 6 or 8 CFM pump would be ideal and so on. 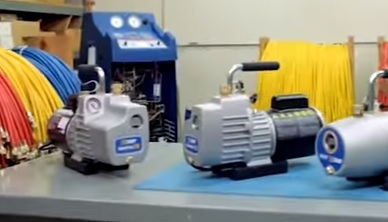 Do you really need a large vacuum pump for small jobs? Well consider this, an 8 CFM pump will get you to 100,000 microns more quickly then a 4 CFM Pump. But once you reach a 100,000 microns all parts will work at approximately the same speed regardless the CFM rating. On the flip side we don’t recommend using too small of a pump on a large system, as that will most likely result in premature wear of your pump. Here are our picks for best HVAC pumps with link to Amazon to read the reviews yourself. ZENY is a budget unit that works well enough for the part time HVAC tech or home DIYer. I have used this unit many times with it working quickly pumping down mini split and other systems. It is a good backup or loaner unit and nice to have around if someone ask to borrow a pump. While it can work in a professional environment it likely wont last long and be needing another unit in 1-2 years. Still its low-cost makes it a god unit for someone looking for a budget unit. FJC makes this 5.0 CFM unit that combines affordability with a good unit. It is quieter than other units although can be a bit slower than comparable models. While there are more durable units that are built to last many years of daily use, the FJC is a good starter unit, backup, or the occasional HVAC tech. Robinair makes many good units including this 8 CFM model. 8 CFM may be overkill if you only work residential but it is still a nice solid pump. This is a good unit for a professional HVAC tech and built to stand up to the daily use a pump will go through. Yellow Jacket is another known manufacture of vacuum pumps with many good units to choose from. It is a Two Stage unit that is a great little vacuum pump for HVAC work. For the money this unit may be one of the best HVAC pumps available. It is built for professional use and will stand up to daily use for many years. The cost is high though with cheaper unit available for part time users. When picking the best equipment for most anything opinions will vary and the above is simply from our experience. For example if you work mainly in commercial your requirements will be much different compared to a residential tech. and keeping oil cleaner longer on system evacuations. A built-in vacuum indicator to let you see exactly when it’s time to start using a micron gauge, and an isolation valve that allows you to isolate the pump from the system without losing the vacuum. Finally make sure the pump you select has a stable base and isn’t too heavy for easy portability.